EIT observation of a Moreton wave expanding across much of the Suns surface. 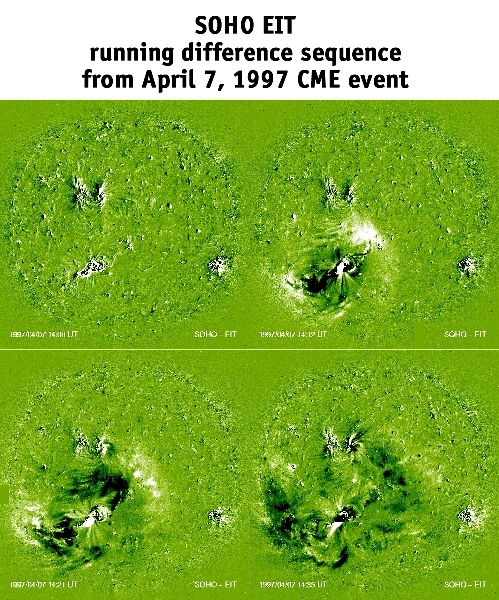 The wave was promulgated by a coronal mass ejection (CME) initiation site on 7 April 1997. 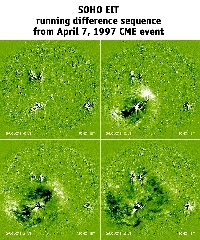 This "running difference" imaging technique emphasizes the changes between successive frames. The wave front travels at speeds of about 300 km/s. These images were formed in the emission lines of Fe XII near 195 Å  this ion is formed at temperatures of about 1.5 million degrees.